The realignment of currencies in the past 18 months has been the most dramatic in decades. A perfect storm is occurring: Federal Reserve tightening; Eurozone and Asian monetary easing; and a collapse of major commodities, all conspire to drive just about every currency in the world to lower values against the USD. Governments are anticipating that this re-alignment will revive economic growth, lead by the external sector. How likely is to happen? how effective are devaluations in changing the fortunes of "open" economies. The term "open" refers to those economies which generate a significant portion of national income from exports, such as Germany, Canada, and several Asian economies. Before reporting on the studies, it is helpful to get a sense of the reasons behind devaluations, the extent of currency adjustments and the importance of exports to major trading nations. Table 1 groups these devaluations by size and by importance as measured by the contribution of exports to national income. 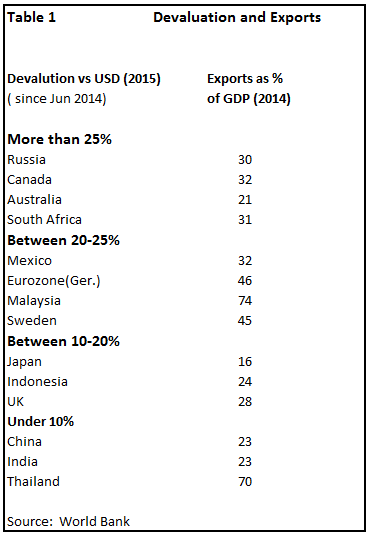 * Depreciation in excess of 25% The greatest depreciations has happened in those countries that are highly dependent on commodity exports, --- Russia, Canada, Australia and South Africa. The worldwide collapse of major commodities resulted in significant declines in their respective trade accounts and national income. Commodity markets are over-supplied and these currencies are not expected to recover anytime soon .The big concern is when will commodity cycle reach bottom and for how long will they remain there. ( eg Germany) and natural resource exporters ( eg Sweden). The European currencies have adjusted downwardly in part a reflection of the EU debt crisis and domestic deflation. ( eg China, India) that convert imported raw materials into intermediate and final goods for export. No major trading country escaped the surge in the USD last year, a condition that is carried forward into 2016, especially in the wake of further declines in oil and other major commodities. The IMF study starts with two basic questions: how responsive are exports to changes in the exchange rate; and has that responsiveness changed over time? (1) The agency estimates the "elasticity of demand"; this measures how price changes affect demand. A number equal to or greater than 1 indicates that demand for exports is very sensitive to exchange rate changes ( ``elastic``) a number less than 1, demand is less sensitive to exchange rate adjustments (``inelastic``). (2). The IMF examined dozens of countries and several sectors over a 15-year period . Their findings are summarized in Table 2. Exports are less sensitive to exchange rate movements over time; half as much in the case of all exports and nearly half as much in the case of manufactured exports. That elasticity has lessened over time and across sectors casts doubt on the effectiveness of the recent currency realignments in promoting growth of exports. The IMF researchers offer some explanation for why demand for exports are less responsive to exchange rate depreciation compared to previous decades. First, worldwide trade has slowed, especially since the 2008 crisis, although the IMF points out that the change in elasticity pre-dates that financial crisis year. Secondly, a more important reason is offered. The IMF states "intuitively, as countries are more integrated in global production processes, a currency depreciation only improves competitiveness of a fraction of the value of final good exports" (1) . This explanation leads us to the OECD study on importance of the foreign value added in determining the effectiveness of depreciating one's currency. "trade in value added" in which it traces the value added in each country and in each industry as part of the production chain leading to final exports. Often overlooked is that devaluation raises the cost of imported inputs. The more a country is integrated within the worldwide supply chain, the less it can expect a currency depreciation to drive export growth--- the high cost of imports mitigates much of the advantages of a lower currency. Take the case of Canada . (Chart 1). Canadian exports contain 25% foreign value added, more than that of the US , its largest export market and competitor. The comparison is even more pronounced in the case of transportation equipment. 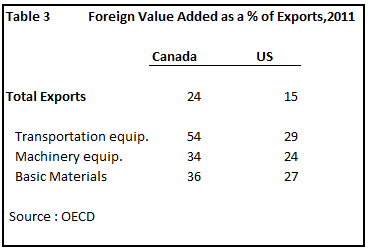 Canadian transportation exports contain more than 50% foreign content ; the US contains only 29% imported value added . Transportation exports comprise the second largest export sector in Canada after oil. This degree of reliance on foreign content suggest that the devaluation of the Canadian dollar will have limited effectiveness in improving the trade imbalances . So,will devaluation work as a means to stimulate export growth and trade in general? Canada is a good case in point. At the global level, trade is expected to expand at less than 3% this year, one of the slowest paces since 2000. The forces that lead up to the currency re-alignments, namely a collapse in commodity prices and a slowdown in world manufacturing continue to plague the world. Canadian non-energy exports have to contend in this difficult environment. As long as commodity prices remain down for long count, Canada will not see any marked improvement in its trade balances . Many observers are pinning their hopes that fall in the Loonie will promote the expansion of non-energy exports. However, it is more likely that Canadians will undergo a fall in their standard of living as long as oil prices remain at these current levels. Simply, the slack is too great to be picked up by non energy exports alone. Canada relies heavily on the worldwide supply chains for production of exports, more than its US competitors .This integration works against the perceived advantage of a lower Canadian dollar. No longer can we expect devaluation to be a panacea. 2) The negative sign indicates that the exchange rate and quantity demand are inversely related.